Mud adobe was of prime interest to the group on this trip and they contacted Jake again, who gave a presentation to them on adobe and the history of San Miguel Mission. At Cornerstones’ suggestion, the group then travelled to Chimayo where they toured the Plaza del Cerro and spoke with several Chimayosos about the its restoration. The Plaza del Cerro is considered the oldest, intact, enclosed plaza in New Mexico, built in the late 18th century and designed defensively to protect the community. Cornerstones, along with Chimayo community members and other volunteers, is engaged in the restoration of this important site. Cornerstones is delighted to have had the opportunity to educate and assist this group during their visit to northern New Mexico. The Taller International de Conservacion y Restauracion de Arquitectura de Tierra (TICRAT) is a binational initiative that started approximately 25 years ago to bring much needed information to communities and professionals in the preservation of historic and earthen structures in our region. These earthen technologies and building typologies in Mexico and the U.S. are a common cultural thread between both nations. 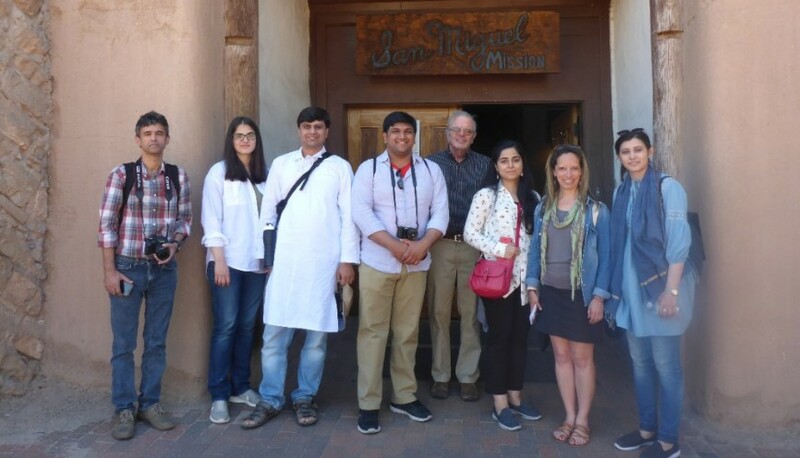 Cornerstones, along with important institutions such as the National Park Service (NPS), University of Arizona, UNM and the Instituto de Antropologia e Historia (INAH in Mexico) collaborated this year to bring the program to Santa Fe and the Pecos National Historical Park in New Mexico, June 12-15. The NPS provided a long list of experts in earthen architecture, including our own Jake Barrow. The workshop was complemented by academic institution lecturers as well as local conservationists. Morning presentations were held at Site Santa Fe, a unique contemporary art space, and afternoon workshops were conducted at the Pecos National Historical Park. Participants enjoyed a hands-on morning lime plaster and washing project at the historic Nuestra Senora de Luz church in Canoncito. Cornerstones is delighted, after a ten year hiatus, to again be an integral part of this important international conference.